Should Europe and the United States accept more refugees from the Middle East and Africa? Europe and the United States have a moral obligation to accept as many refugees as possible. 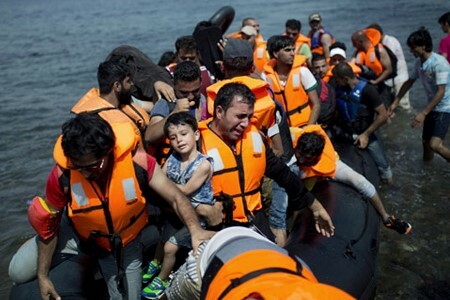 People from the Middle East and Africa are fleeing war, persecution, and life-threatening danger, and neither curbing search-and-rescue missions nor increasing security measures to keep them out will stem the tide of people desperate enough to risk their lives to reach safety. Stereotyping refugees—many of whom are Muslim—as potential terrorists is inaccurate and callous, and refusing to welcome them undermines the values and ideals for which the European Union and the United States claim to stand. Welcoming refugees from the Middle East and Africa poses a security threat to Europe and the United States and encourages more people to risk their lives in the hands of human smugglers. Assimilating hundreds of thousands of Muslims into predominantly Christian European countries is not a simple matter, and it would be irresponsible to ignore the social and economic problems that admitting large numbers of refugees will bring. In light of recent terrorist attacks in France and other places, the European Union and the United States should proceed cautiously and with thorough consideration of security concerns. Click here to view Issues & Controversies’ complete and unbiased coverage of this timely issue.